Kitchen Window: The Pies Of Late Summer At the end of summer, when you're sunburned and hot and maybe a bit tired of peaches or berries, try adding tangy custard, a pecan crumble or dark caramel to your farmers market cache, or pair two or more fruits for a refreshing change. Get recipes for Nothing-In-The-House Pie Crust, Peach-Pecan Pie, Fig-Pistachio Tarte Tatin and Plum And Orange Flower Custard Galette. Peaches in the summertime, apples in the fall. If I can't have the one I love, I won't have none at all. There is a fleeting transitional mini-season between summer and fall with its own variety of produce ripe for baking. Raspberries begin to re-appear for their fall season, figs emerge, and stone fruits persist just a little while longer. I still like that lyric for its simplicity and its assertion of seasonal eating at a time when that was unquestioned. You ate fresh apples in the fall (and probably storage apples through the winter) and peaches all summer. Love could be fleeting and unreliable, but autumn apples and summer peaches would always be there. That little girl who was serenaded each night with words of lost love and fruit grew up to have a pie obsession. I write a pie blog, bake at least once a week, and collect old pie paraphernalia, heritage recipes and family stories. In a way, that old verse explains this obsession. Though I have many reasons for loving the classic dessert — its ties to tradition and the past, its association with women home cooks and, of course, its deliciousness — one of the main reasons I like pie is because maybe more than any other dish, it is dependent on season. Though there's nothing wrong with stockpiling your summer berry bounty in the freezer for an almost-fresh pie in the dead of winter, everyone knows that pies are best made with the freshest fruit you can find. So, apple pie is our quintessential fall treat, rhubarb welcomes the return of spring and a blueberry pie, while best with fresh berries, transports you to a hot day in mid-July even if you use frozen berries in January. Emily Hilliard is a Washington, D.C.-based folklorist, writer and baker. She writes the pie blog Nothing-in-the-House and bakes at Nothing-in-the-House Baking Co. She also plays the fiddle and is an old-time music enthusiast. In most parts of the country, we're approaching the time when vacation comes to an end, the nights start to get cooler and U-pick signs switch from peaches to apples. Serious bakers, like me, miss the high-summer berry season, when there's so much fruit to bake with that a farmers' market trip can leave you in a tizzy of indecision. Although it's tempting to launch straight into apple season with the allure of Dutch apple crumb pies, French tarte tatins and oatmeal-topped crisps, there is a fleeting transitional mini-season between summer and fall with its own variety of produce ripe for baking. Raspberries begin to re-appear for their fall season, figs emerge, and stone fruits persist just a little while longer. The new arrivals and second round of others give bakers an opportunity for unusual combinations and creativity. At the end of summer, when you're sunburned and hot and maybe a bit tired of peaches or berries, try adding tangy custard, a pecan crumble or dark caramel to your farmers market cache, or pair two or more fruits for a refreshing change. Though I don't know any old folk songs that tell about late-summer fruit, I know it's worth singing about. Don't let pie crust scare you. No matter the season (though it's more difficult in a hot kitchen), making pie crust from scratch is easier than you think and completely worth it. There are many ways to make a great pie crust, but in my opinion the best crusts are made with butter. Though it may be a little harder to work with than a lard or shortening crust, an all-butter crust is versatile, vegetarian-friendly and full of flake and flavor. It's also very important to keep the butter as cold as possible. Many bakers throw their butter in the freezer about 30 minutes before making their pastry. I generally make sure my butter has been chilled for several hours prior to use, and assure that my liquids — the egg, water and apple cider vinegar that my recipe calls for — are also very cold. This is because those little chunks of butter are what make the crust flaky. If you overwork the dough and the butter melts, the crust can become tough and flat. Keep it cold and you'll have flake. Here's the recipe I use for almost all of my pies. It makes 1 double crust, so if you're making a single-crust pie (bottom crust only), halve the recipe, or wrap the other half in plastic and freeze it for your next pie. Using a pastry cutter or fork and knife, cut in the butter. In a separate small bowl, whisk together remaining ingredients. Pour the liquid mixture into the flour-butter mixture and combine using a wooden spoon. Mix until dough comes together in a ball, but is not overly mixed. Form into ball, cover and cool in refrigerator for at least an hour before use. This peach-pecan pie adapted from Nancie McDermott's Southern Pies (Chronicle Books 2010) seems just the thing for the tail end of peach season, as apples are starting to gain ground on farmers market tables and the line of peach cartons recedes. 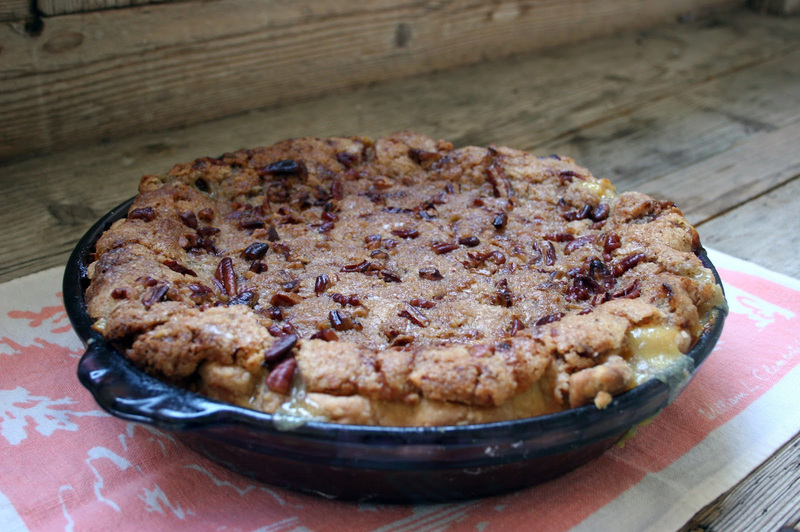 I think of pecans as a fall pie filling, but this pie can work on any summer day. This suits me as a perfect transition pie, with the pecan topping hinting at those summer nights when your mind starts drifting toward bonfires, doughnuts and, well, apples. McDermott suggests serving with cinnamon whipped cream, but vanilla or cinnamon ice cream are also nice. Prepare pie crust and chill dough at least 1 hour. Roll out and fit into a greased and floured 9-inch pie pan. Crimp edges decoratively. For the filling, scatter peaches over the bottom of the pie crust. Using a whisk, combine sugar, sour cream, egg yolks and flour in a medium bowl until everything is well combined. Pour this thick, creamy sauce over the peaches. Place the pie in the oven and bake until the custard is set and the crust is golden-brown, about 30 minutes. Combine butter, sugar, flour and cinnamon in the bowl of a food processor. Pulse until the mixture resembles peas and cornmeal. Stir in the chopped pecans and set aside. Remove pie from the oven and scatter the pecan topping over the pie. Return pie to the oven and bake until the crumb top is golden brown, 10 to 15 minutes more. Place pie on a cooling rack and let cool to room temperature, about 45 minutes. Can be served warm or cold. This recipe for a French tarte tatin — a tart baked upside-down so as to richly caramelize the fruit — comes from Pieminister, a popular pie shop in the U.K. This adaptation is from its Pieminister Cookbook by Tristan Hogg and Jon Simon (Bantam Press 2011). They recommend serving it with Greek yogurt, but it would also be wonderful with goat's milk ice cream. Prepare crust and chill in refrigerator at least 1 hour. When chilled, roll out into an 11-inch circle, stab it with a fork in several places and place on a cookie sheet or cutting board between two sheets of parchment paper. Refrigerate while you prepare the filling. Trim the stalks of the figs and halve them lengthwise. Set aside. In a large oven-safe frying pan or cast iron skillet, place sugar and water and heat on low until sugar dissolves. Once sugar has dissolved, raise the heat to medium-high and bring sugar water to a boil and cook without stirring until the syrup is thick and has become golden-caramel in color. Reduce the heat and add the figs, making space so they all fit. Be careful not to burn yourself on the hot caramel. Cook until the figs are tender and release juices but still hold their shape. Remove them with a slotted spoon and set aside in a small bowl. Boil the caramelized juices until they are thick and syrupy, 3 to 5 minutes more. Remove the pan from the heat and stir in the butter until it melts. Scatter the pistachios over the pan and return the figs to it, cut side down, in concentric circles. Put the frying pan back on the heat until the juices bubble. 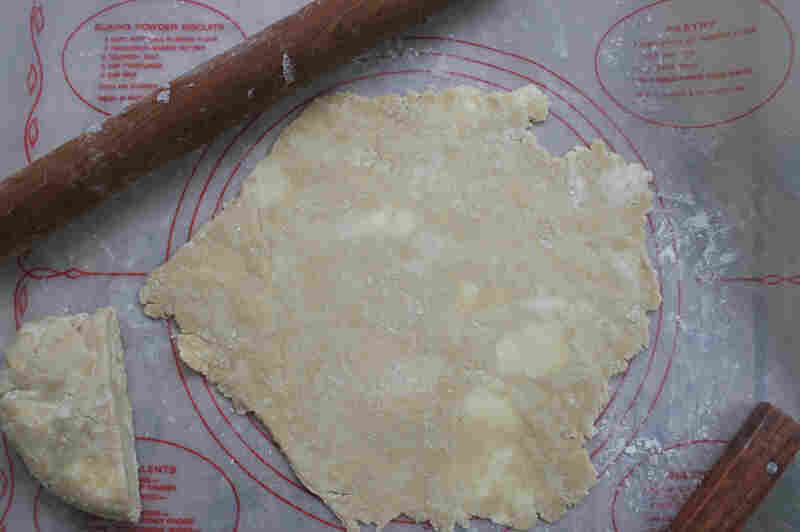 Put the circle of pie crust on top of the filling and tuck it firmly into the edges of the frying pan to form a crust. Transfer the pan to the oven and bake for about 25 to 30 minutes until the pastry is golden brown. Once the tart has settled for a minute, put on your oven mitts and flip the tart onto a plate (have courage). 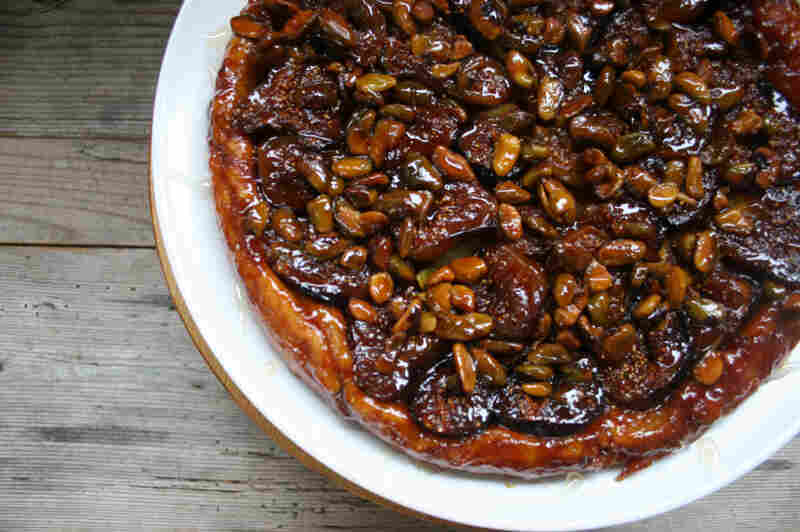 Drizzle the tart with honey and a few extra pistachios, if you desire, and serve with goat's milk ice cream or Greek yogurt. Prepare crust and chill at least one hour in refrigerator. Once chilled, roll out into an 11-inch circle and place in a greased and floured 9-inch pie pan. Do not flute crust--You will have a 2-inch overhang to fold over the filling. Refrigerate while preparing filling. In a medium bowl, whisk together creme fraiche, egg yolk, brown sugar and orange flower water. Pour into the pie. Arrange plums in concentric circles over the custard filling. 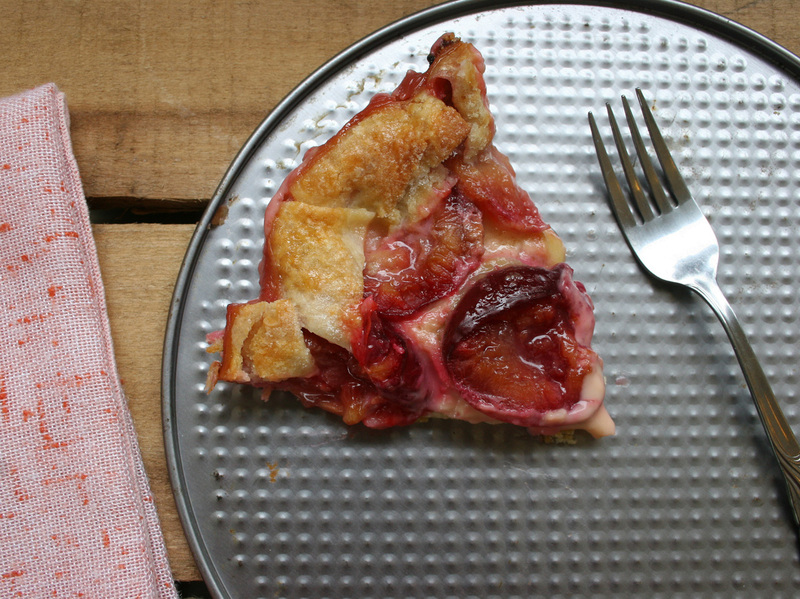 Decoratively fold pie crust over the edge of the plums. 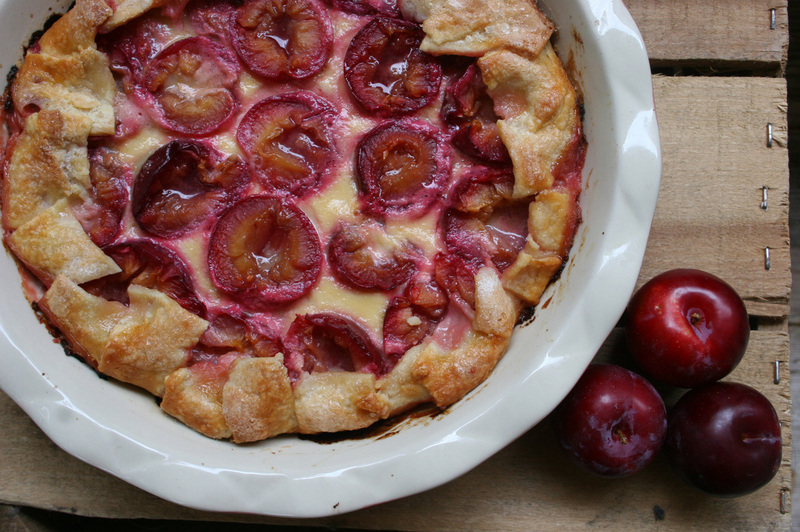 Brush an egg wash over the crust and sprinkle it and the plums with turbinado sugar. 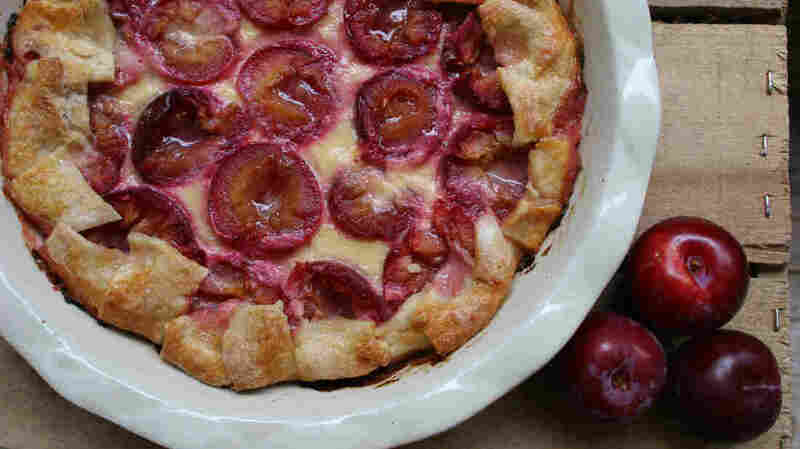 Bake about 40 minutes until crust is golden brown, custard has set and plums are juicy. Let cool. Enjoy warm or at room temperature.